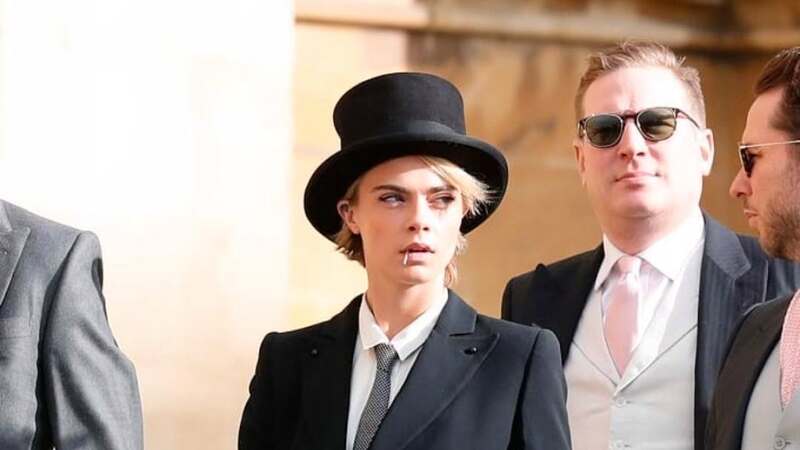 Cara Delevingne turned heads Friday in a suit and top hat at the royal wedding. Eugenie and Brooksbank tied the knot at St. George's Chapel at Windsor Castle. Delevingne's sister, model Poppy Delevingne, models Kate Moss and Naomi Campbell and actress Demi Moore were among the other celebrities in attendance. Eugenie, the younger daughter of Prince Andrew, Duke of York, and Sarah Ferguson, Duchess of York, wore a gown with a fitted bodice and pleated skirt. Her sister, Princess Beatrice, served as maid of honor at the wedding. Delevingne is known for her modeling work with Burberry and Chanel. She starred in the movies "Paper Town," "Suicide Squad" and "Valerian and the City of a Thousand Planets," and will next appear in "London Fields" with Amber Heard.